provide the basic construction of these ORIGINAL REEL ART TABLES. 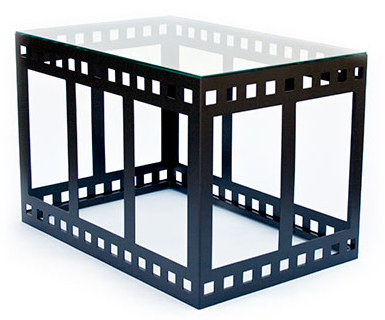 Dress up your theatre with our Theatrical Glass Topped Film Reels Table. 18 in. Diameter glass top. Available in a Luxurious Black Gloss finish. Our NEW Bar Stools are Enhanced with Your Choice of Four Theatrical Design, and also Your Choice of Four Beautiful Crushed Velour Seat Colors. Constructed of Sturdy 1 inch Steel Tubing. Stool Height 32.5 inches From Floor to Seat Cushion. Seat Cushion measures 16 inches by 16 inches. Legs are Equipped with Adjustable, Non-Scratching Feet. Select Design and Cushion Color below. Place your mouse pointer over the picture to view all Four Designs. SAVE $100.00 – Purchase a Set of Four Stools, One of Each Theatrical Design For Only $1659.96. 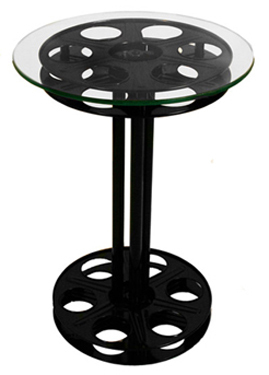 Our NEW Reel Bar Table is Enhanced with a Steel Laser Cut Movie Film Reel Top. Fully Constructed of Steel with Four Sturdy Legs. Table Top Measures 42 inches Round Diameter. SAVE $150.00 on Complete Set – Include a Set of Four Bar Stools, One of Each Theatrical Design For Only $2659.95. Authentic Goldberg Reels Top Off These Theatrical End Tables. Your Choice of FIVE Table Top Sizes and THREE Metal Color Finishes. A 16mm Steel Reel is topped on the 12 inch diameter Table and 22 inch Height. A 35mm Cast Aluminum Reel is topped on our most popular 15 inch diameter Table and 23.5 inch Height. A 35mm Aluminum Flange Reel is topped on the 20, 24, and 30 inch diameter Tables and 23 inch Height. All Tables have a Simulated Film Core. Round Tempered Glass on Top. Select Your Choice of Table Top diameter Reel Size, Reel Color, and Tube Post Color below. Unique Film Reel Rewind Design Coffee Table. Two 15 inch 35mm Cast Aluminum Goldberg Reels with a Simulated Film Core on a 20 x 40 inch Table and 18.5 inch Height. Two 9 inch Steel Plate Bases with Shipping Can Covers. Your Choice of Black, Silver, or Chrome Reels. Your Choice of Black or Silver Tube Posts. A Unique Cinema Design Reel Table Perfect for Your Concession or Bar. The Table Top is constructed with a 35mm Aluminum Flange Goldberg Reel with a Simulated Film Core in Your Choice of Reel Size and Metal Color. Available in Your Choice of either a 28 or 35 inch Height. Your Choice of Metal Color on the 3 inch diameter Tube Post. 3 - Authentic Goldberg 15 inch 35mm Cast Aluminum Raw Finish Reels. 3/8 inch Tempered Glass Top 42.5 inch Round with Pencil Edge. 3 - 9 inch Steel Steel Powder Coated Back Posts. 3 - Authentic Goldberg 18.5 inch 35mm Aluminum Flange Reels Powder Coated Chrome. 3/8 inch Tempered Glass Top 47.75 inch Round with Pencil Edge. Due to its size, no home delivery for this special table. Must be shipped to a commercial address, or Carrier Terminal Pick-up only. You will be notified of Terminal location in your area. All Steel Laser Cut Sturdy Construction with an inset Tempered Glass Top. Stunning Matte Black Metal Finish. ChairSide Tables are the Essential Media Room Furniture with Two Deep Built-in Cup Holders. The ChairSide Table fits Comfortably Alongside your Favorite Chair or Sofa, or even at Bedside. Your Snacks are always Secure from sliding off the Table Top with a Gallery Trimmed Lip along the Edge. Minimal assembly with no tools required. This Versatile Table Adapts to its Situation. In the Den as an end table...In the Family Room as a Bar Table...In the Home Theatre as a Safe Haven for Your Drinks, Snacks, and remote. Your Choice of the Chairside Table with a Stunning Mahogany Stained Table with an Oval Leg, or a Turned Leg in your Choice of having your Table stained in Beautiful Mahogany or Oak. Oxford Tables are the Essential Media Room Furniture with Four Deep Built-in Cup Holders. The Oxford Table fits Comfortably Alongside your Favorite Chair or Sofa, or even at Bedside. The Table can Easily be Assembled when Needed, or Safely Folded and Stored within the Included Canvas Pouch. The Unique Design offers Deep built-in Wooden Cup Holders for your bottles, glasses, and stemware. The Two Trays on The Oxford can be Placed to Meet Your Needs. The Table Top with Cup Holders Can Be Removed Easily and the Flat Serving Tray Can Fit in its Place Making The Oxford’s Versatility a Smart Choice. View the Slideshow to see the ease of use and unique design of The Oxford Serving Table. The Oxford Table is stained in a Mahogany Solid Birch Frame.